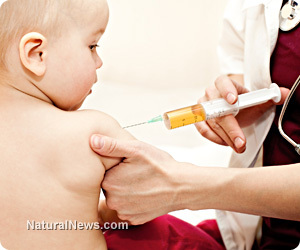 (NaturalNews) The China Food and Drug Administration (CFDA), along with the National Health and Family Planning Commission (NHFPC), had already suspended use of BioKangtai's hepatitis B vaccines, and now the inoculation, produced by a separate Chinese company, is believed to have claimed the life of its 12th infant victim on December 27, 2013. Since November, eight of the 12 infant deaths were linked to BioKangtai-produced hepatitis B vaccines, prompting the suspension, as well as a joint investigation by the CFDA, NHFPC and WHO. Outrage and panic has since ensued amongst the Chinese public, including apprehensive parents who are mandated by government programs to vaccinate newly born children. Despite the fact that BioKangtai is not the only vaccine producer responsible for recent infant deaths in connection to hepatitis B vaccinations, they are the only company who has had its inoculations banned; thus, the shot is still in use throughout the country. The WHO has since asserted that Chinese hepatitis B vaccinations are safe and made to international standards, but they have also acknowledged that some risks simply cannot be avoided. Investigations into the situation are ongoing, though it is well known that complications from the hepatitis B vaccination are not uncommon. The hepatitis B vaccination has endured a great deal of criticism due to its links to various neurological and immunological disorders including multiple sclerosis, autism and rheumatoid arthritis, to list a few. While the CDC and WHO are staunch supporters of the hepatitis B inoculation, many in the public sphere do not believe that the potential benefits outweigh the risks, particularly in regard to children. Given the inherent dangers of the vaccine and its connection to sudden infant death, health professionals commonly believe that screening mothers for hepatitis B would be much more efficient than blanket vaccinations of children. The inoculation is also believed to have a limited life span in the body, further casting doubt on its importance for children, as the disease is typically spread by adults through acts uncommon to children, such as unsafe sexual behavior and sharing of needles. The CDC however continues to recommend a three-tier administration of the hepatitis B inoculation, starting at 12 hours after birth, again at 1 to 2 months and a final dose at 6 to 18 months.